It's all fun and games around here (until someone gets murdered!). 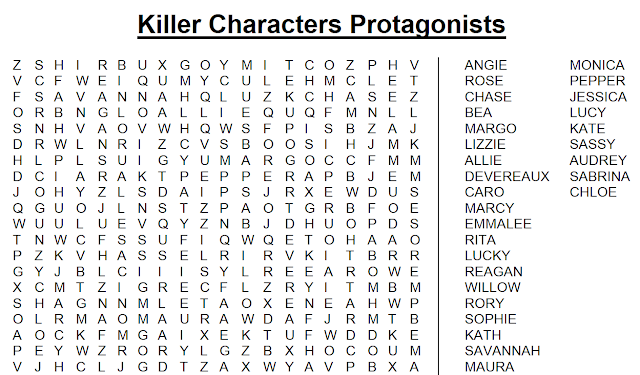 Have some fun with our first Killer Characters word search puzzle. Find the first names of twenty-nine of our main characters hidden in the puzzle below. Leave a comment with the first name you spotted and what series they're from! I spy Willow from Janet Bolin's Threadville series and Monica from Peg Cochran's Cranberry Cove series! I sure do enjoy word searches. Now Crosswords (shudder), no thanks. Although a cozy themed one might be fun! This is so much fun! Thanks for putting this together. What a delight: a killer characters' word search puzzle! First character name spied was Savannah from Cheryl Hollon's Webb's Glass Shop series. The first I spotted was Savannah from the Webb's Glass Shop mysteries. That was a lot of fun! Savannah from Cheryl Hollon's Glass Shop Mysteries. I LOVE hand-blown glass! I spotted Margo from A Disguise to Die for. Hmm, imagine that! Pepper from the Spice Shop Mystery Series by Leslie Budewitz. Pepper from the Spice Shop series. I spotted Sophie (Winston) from the Domestic Diva Series. Savannah from the Webb Glass series.